With temperatures around 20°C and occasional light rain, winning times were much faster in this jubilee edition of the race than in previous years over the classic route from Marathon to Athens. Participation was up from 5,000 last year to 7,950 this year for all events. Among them were 4,750 marathon runners. 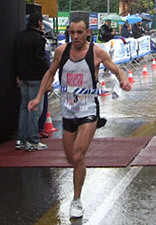 Abel Anton, Spain's marathon World Champion from Athens 1997 and Seville 1999 ran in the 10km race. 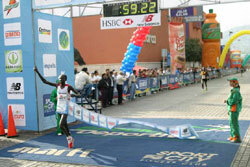 Kenyans had won the Athens Classic Marathon three times in a row, and they again dominated. Eight of them formed the leading group at half way (68:07). At about 35km Benjamin Korir Kiprotich broke away and opened a decisive gap. "I had tried to get away earlier. But then I decided to relax a bit more and let the others catch me again. I was sure that I would win the race," said the 29 year-old who ran a personal best of 2:10:43 earlier this year when he finished third in Brescia. Defending champion Henry Tarus came in third while Georgios Karavidas, in tenth, won the Greek championship. In the women's race the big favourite took the honours: Svetlana Ponomarenko passed halfway in 1:15:56. The 37 year-old, who had won the Frankfurt Marathon in 2006 and has a personal best of 2:29:55, ran a very consistent pace. "The weather was fine for me. I would now like to qualify for Beijing next year," she said. Cool conditions allowed for fast running, and winner Joshua Chelanga just failed, by one second, to beat the course record set by Jason Mbote a year previously. From a group of 12 runners at halfway there remained six with 10km still to run, after all pacemakers had completed their task. Only four kilometres later it became a head to head contest between Joshua Chelanga and Abderrahime Bouramdane in which Chelanga made all the running and never quite allowed Bouramdane to get on level terms. The women's race featured an entirely domestic field, and Eung Jung Lee had no serious rival as she passed 10km with and already impressive lead. She pressed on to a solo victory and beat the old course record, set four years ago, by 58 seconds. Surging away from Kenyan Salina Kosgei at 36.5km, Olympic Champion Mizuki Noguchi won in a new course record, eclipsing Eri Yamaguchi's 1999 mark of 2:22:12 writes Ken Nakamura. 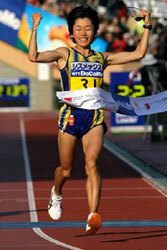 Noguchi became only the second runner to win all three big Japanese women's marathons — Tokyo, Osaka and Nagoya. Katrin Dorre of the DDR is the only other runner to have done this. Noguchi's win gains her near-certain selection for the Bejing Olympic Marathon. A lead pack of nine runners quickly emerged, and was down to six by 5km, passed in 16:38. 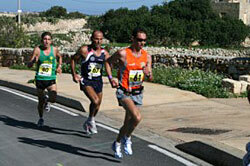 The pace remained moderate due to unseasonably warm weather (17-20°C) and a head wind. Five runners passed 15km in 50:23 and a kilometre later Yoko Shibui, Noguchi and Kosgei went ahead, with Akemi Ominami and Bruna Genovese trailing. The lead trio passed halfway in 1:11:16. After the turn-around point, with the wind now behind them, the pace picked up to sub-3:20/km. The race had been billed as a showdown between Shibui and Noguchi but just before 30km Shibui lost contact. From 30-35km was covered in 16:26, the fastest split of the race. 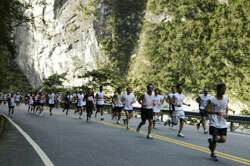 Noguchi ran the uphill 36th kilometre in 3:16, and began to pull away over the next kilometre. She covered the uphill section from 35-40km in an incredible 16:56, faster than the previous best of 17:08 by Valentina Yegorova in 1994. Kosgei ran on to a time only 10 seconds slower than her personal best but Shibui was passed by Genovese at 38km and a kilometre laer by Ozaki. She faded to seventh in the slowest time of her marathon career. The Ethiopian pair of Tamrat Elanso and Adaneche Beyene Jemilu proved to be easy winners but pride of place went to the meeting organisers who ensured the race went ahead without a hitch despite Lebanon's present political situation writes David Martin. 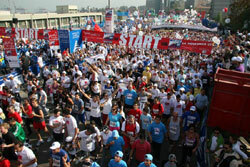 Race president May El Khalil said "We have people from all sorts of religions and life running. They come to participate. They come for the 'Love of Lebanon'. Over 3000 from the army are participating. Really we have everybody on our side supporting us." With a controversial Presidential election scheduled for Wednesday, organisers turned down an earlier government suggestion that the race should be postponed. They refused to concede to what occurred a year ago after the gunning down of a cabinet minister in a nation where political problems regularly develop into bloodshed between warring factions. "Every great ciy has a marathon" said El Khalil. "During these difficult times it unites people and it becomes a space for hope and a time for celebration." The event went ahead with positive results for Elanso and Jemilu who led a strong Ethiopian contingent to the Lebanese capital. Elanso scorched ahead of his rivals after 35km to clinch a simple victory. He slowed after breaking up the field and ran in isolation for the last 7km. He had massive encouragement, with thousands of spectators roaring him along. The 30-year-old unknown posted a personal best and overcame more favoured rivals who had to settle for a private battle between themselves. David Kuino, this year's Bonn champion, won the joust, pushing Abraham Belete into third place for the second succesive year. Adanech Jemilu, who had finished third in the Dubai Marathon in January, was the fastest woman in the field and also scored an easy victory. Breaking the Kenyan stranglehold of previous years — 9 victories in 12 editions — a 33-year old Moroccan, resident for the last for years in Monza, won the 13th edition. Abdelhadi El Hachimi attacked decisively in the 23rd kilometre to beat off the challenge of Kenyan Ben Kipruto, who had a 2:12 timing to his credit. Kipruto slowed considerably and showed advanced symptoms of hypothermia at the finish. 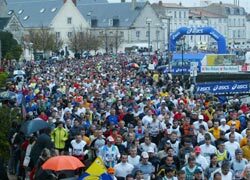 The weather had been untypically cold all week and there were three cases of hypothermia among the total of 1000+ runners (207 Marathon finishers, 767 in the Half Marathon). 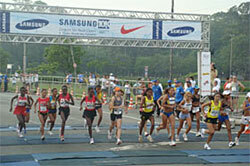 The event had 4122 runners from 73 countries, with 522 in the marathon and 3600 in the Half. There was also a 10km event for paralympic competitors. 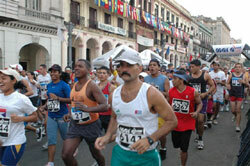 One day before, in the 'Maracuba' festival, a total of 5198 races took place simultaneously throughout the country with up to two million people participating and 30,000 volunteers lending their support. Next years' races take place on 15-16 November. Of the 140 runners who started the three-day event, 120 of them entered Valetta's Freedom Square at the end of the final 25km stage. Tsegaye Kebede, winner of the 23rd Abebe Bikila Marathon in June, took a deserved win. Just 20, Kebede set a marathon best of 2:08.15 only six weeks earlier, in the Amsterdam Marathon. The scorching initial pace claimed pre-race favourite Eshetu Wondimu (who dropped out at 4km). The race then turned into a two-way battle between Kebede and Ayele Abshiro, who escaped as early as the half way point. Abshiro unsuccessfully tried to get away 7.5km and when Kebede responded with his own thrust a klometre later Abshiro had little left. It was a cruel endgame for Abshiro who was powerless to respond as others came past to beat him to the podium positions. "I ran last year but I did not finish in the top twenty. It is a surprise for me to win." said Kebede after the race. Wude Ayalew dictated the pace for much of the women's race before powering forward just after 9km to take a commanding victory. 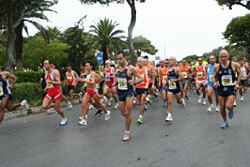 In a characteristicly frantic start there was much jostling for strategic positions among the initial pack of 30 runners. The first clear move came from 20-year old Ayalew at 4km, and reduced the pack to 20. The second came from pre-race favourite Derebe Alemu who whittled the pack down to 12. Ayalew's penultimate launch at 7km reduced the race into a three-way battle and dropped the likes of Alemu and former two-time winner Genet Getaneh. Ayalew finally saw off Mergia's challenge with another impressive spurt of energy that clinched her victory. Both course records were broken in this 12th edition of the race writes Brendan Reilly. On the men's side, the trio of Rachid Kisri of Morocco and Kenyans Sammy Kipkoech Tum and Joseph Riri gradually pulled away with two pacemakers to go through halfway in 65:04. Kisri went ahead shortly after 25km, getting clear of both pacemakers and his two rivals. Running solo against light but increasing headwinds, Kisri led by 250m at 36km, but weakened over the next uphill kilometre. Kipkoech and Riri, working together, finally caught Kisri at 41km. 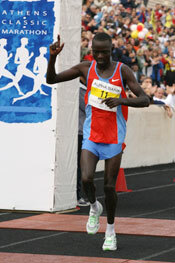 Kipkoech then put in a great kick to break the 2:13:22 course record of China's Han Gang (2005). Riri held off Kisri in the final 400m, with the pair finishing just outside the old course record. Lidia Simon's resurgence continued. With fifth place at the Osaka World Championships, Simon is showing signs of her old self. Her major challenger in Shanghai was expected to be Japan-based Kenyan Ruth Wanjiru Kuria, who had requested a pace of 73:00 for the first half in her marathon debut. The Shanghai course put this beyond reach, as the pair came through halfway in 74:09, accompanied by a pair of pacemakers and a handful of male marathoners. As had Kisri, Simon began to pull away after the course turned north into head winds after 25km, opening an ever-widening gap on the rest of the women's field. Continuing her solo effort through the finish, Simon became the first sub-2:30:00 woman in Shanghai's history, breaking Yanan Wei's 2004 course record by 69 seconds. Japan's Kiyoko Shimahara, just resuming her own training after 6th place in Osaka, was some six minutes back in second place. 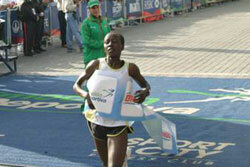 Wanjiru took two falls in the second half of the race, hit once by a bicyclist and once by a pothole. 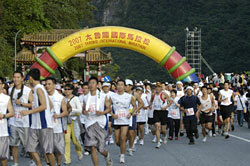 For each of the 13 years since it was founded this race has improved in all aspects, and now draws 12,000 participants. In the women's elite race, set off 15 minutes before the mass race, Maria Zeferina Baldaia ran side by side with Nancy Jepkosgei Kipron up to 6km, at which point the Kenyan started to draw ahead, to win by 36 seconds. Among the men the competition lasted for the entire duration of the race. At 5km the Kenyans Titus Kosgli Kibii, Kiprono Mutai Chemwolo and Kosgei Kenneth Kiplino went ahead and alternated the lead. In the final metres Kibii had the speed to win. 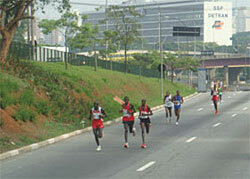 Luis Paulo da Silva Antunes made a late surge to overtake Kosgei for third place. The race start at Piazzale Michelangelo, across the River Arno from the Duomo and Ponte Vecchio offers a stunning view of the city. The course is mainly flat but it twists and turns all over Florence. Participants ran along the south bank of the river, coming back around the Palazzo Pitti, and past the Ponte Vecchio, crossing the river a little futher and making another out/back eastward along the north bank. Halfway came at the athletic stadium and after a downbeat section crossing the railway a couple of times the route heads in to the most spectacular parts of the city past the stunning Duomo, Campanile and Baptistery, through the Piazza della Republica, and out for a third out and back along the river, this time heading west along the north side from the 30km point. The best was saved for last, along the river to the Ponte Vecchio, sharp left and round to the Palazzo Vecchio, Loggia Dei Lanzi and the Uffizi Gallery, and back up to the Duomo at 40km. Then back to the river, and round to finish in the spectacular Piazza Santa Croce. With 8600 registered, the participation record was again surpassed. Hopes were also high, with a strong male elite field, that the 2003 course record of 2:11:34 would fall. But the rain fell first, just before the start, and played on the morale of the field. Kenyan pacemakers Kyui and Kurgat led the troops. France's James Theuri, a favourite, followed closely with another Frenchman, Loïc Letellier, in tow. The rain had already slowed the pace and any hope of beating the record was lost. Passing halfway in 1:06:40 James Theuri started vomiting at 27km and could not dethrone the event record holder, Elijah Yator. The pace was now headed for a 2:13 finish with Loïc Letellier, Johnstone Chebii, and debut marathon runner Akello Rutto still contesting. The trio flew away towards the finish with the 39-year old Chebii getting there first. In the women's race Carmen Oliveras, Leopoldina Silveira and Flora Kandie formed the lead group before Kandie moved ahead at the halfway point for her second victory of the year, after winning Helsinki in August.